PM development, programming, hacking and all that fun stuff. 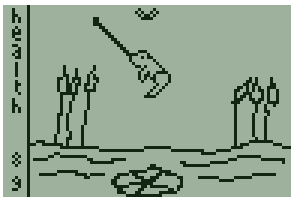 Anyway, I now am working on a version of my never-finished Game Boy game "Frank the Fruit Fly." It's kind of like Togepi's adventure, only you use the directional pad and B button for it. I spent last night programming the title screen and pressing A to start the game. Frank will fly off screen when A is pressed and the game will start. Frank can then fly around the screen, even diagonally. I read in an .asm file that I have to do something special when the game gets to be 64k or higher. Is it fairly easy to do? I've decided to stop work on the Pokemon Party Mini 2 game I was working on and work on this instead. How do you like my banana? Should I make it be the outline of one or is this okay, or what? like the first one more! 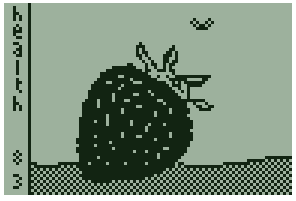 I liked the first one more as well, but I liked the dithered ground, so I combined the first banana's look with the dithered ground in the second picture and got this. What do you think? Still working on this. Here's a frog screenshot. Looks like frogs and flies, that would be a cool game to have on the mini, but I am not sure any arcade style games can maintain a constant link through the IR. A bad strawberry. Eating this causes Frank to lose health instead of gain it. 1. 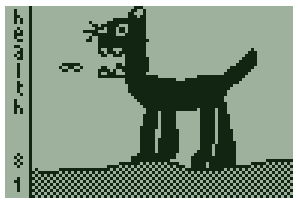 I read somewhere in the samples of the Pokemon Mini that something has to be done to make a ROM be more than 64k. What is it? I want this game to be 4MB like all the others. 2. Can someone add this game to the Homebrew section on this site?